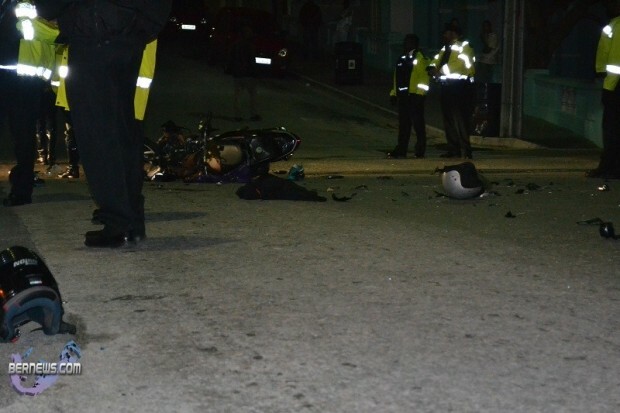 [Updated] Two men were taken to the hospital, and around twenty Police officers converged on Court Street after a collision between a Police vehicle and a motorbike following a high speed chase just before 4am this morning [Jan 1]. 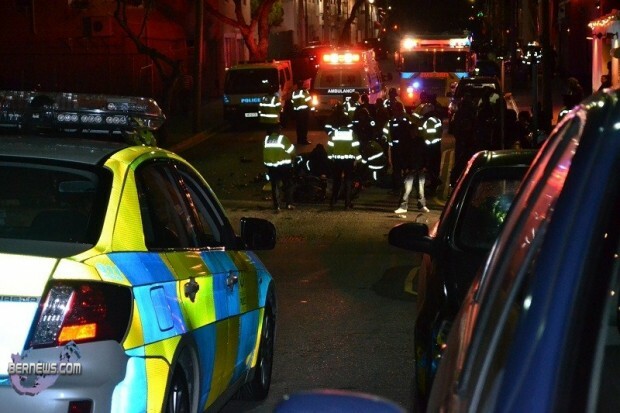 The accident occurred while numerous people were still on the streets finishing up their New Year’s celebrations. Bystanders, many of whom expressed their displeasure, said that the bike was traveling onto Court Street when it collided with a Police “paddywagon.” Numerous people on scene claim that a Police car was following the bike prior to the accident, with it being unclear whether the Police were pursuing the bike or not. Both gentleman were attended to by medical personnel on the scene before being taken away by ambulance. Bernews unofficially understands their injures are not life threatening, and at least one of them has a broken leg. 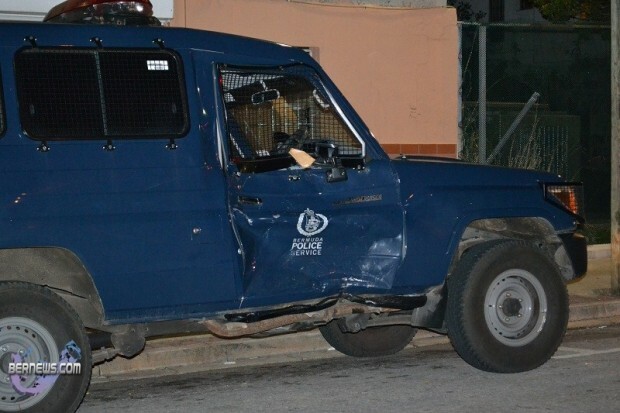 The Police vehicle involved in the accident is pictured below. We will update with an official Police statement later today. A number of Police officers rushed off from the scene with sirens blaring at approximately 4am. Bernews understands that additional incidents took place in the same time span. 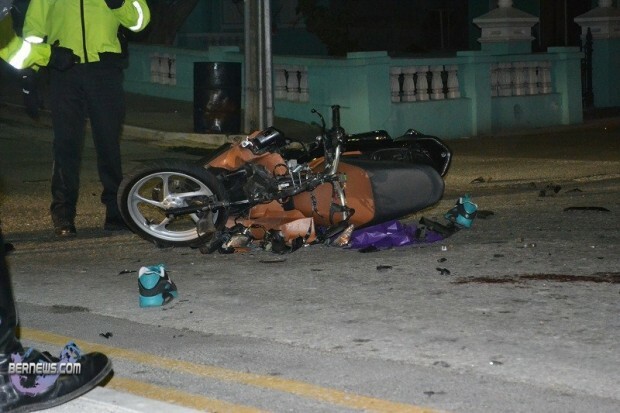 Police were on mobile patrol at around 3:35am January 1st 2011, when they attempted to stop a man riding a motorcycle with a passenger, traveling at a high rate of speed on Angle Street. Officers followed the vehicle, however the cyclist continued at a high rate of speed, failing to come to a stop at the stop sign at the junction of Court and Angle Streets. This resulted in the motorcycle colliding with another police vehicle that was traveling South on Court Street. 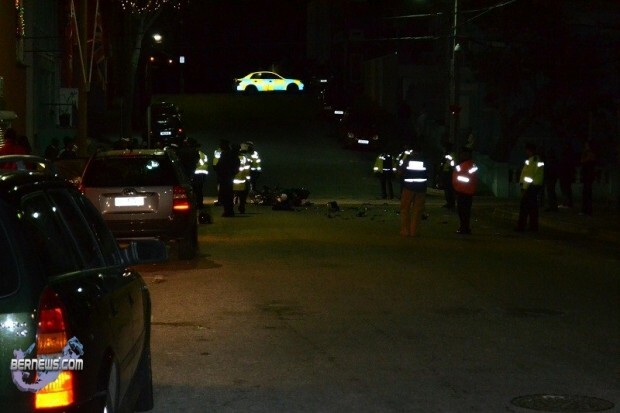 Officers immediately rendered assistance to the two men on the motorcycle until the ambulance arrived and both men were taken to KEMH were they are being treated for multiple superficial wounds and both men received a broken leg. Traffic Collision investigators were on scene and an active inquiry into this incident is underway, and police are appealing for any witnesses to this incident to contact police on 2950011. Looks like a 90 degree impact. Looks like the bigger vehicle won that time. Looks like another Happy New Year…business as usual. The 5th picture of this informative news release is the and I hope the ironic venture that I hope will prevail during 2011. Any news on whether the police officer driving was injured – maybe that isnt newsworthy – but the impact is on the driver side door and looks like it could have been nasty for the officer driving. Side door definitely took a hit…I believe they are fine, although not confirmed. There was nothing said on scene by any of the bystanders about a Police officer being injured, and the Police statement did not indicate any injury to an officer. They were obviously doing a crazy friggin speed in order for the door of the paddy wagon to be jacked up the way it is!!! Those doors are serious compared to the way these cheap vehicles are made lately. Lucky the injuries weren’t life threatening cause it surely could have been worst. im looking at the first picture and your standing on top of the hill, why is it that i don’t see a picture of the paddy wagon on scene where the bike actually hit them they were suppose to stay in that spot, correct??? something fishy about this whole accident, eye witness say that the police never had their sirens on so how does it become a high speed chase?